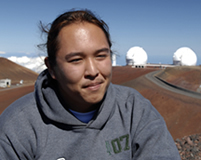 Joseph Hernandez is a Electrical Engineering student at the University of Hawaii at Manoa and will be graduating in the fall. His current interest lies in wireless communication, control, and sustainability. Joseph has plans for graduate school but will pursue employment after graduation. He is also a certified scuba instructor with PADI and an emergency first response instructor. Joseph enjoys many activities apart from school including scuba diving, taekwondo, hiking, working out and fishing. Joseph was born and lived most of his life on Guam and plans to someday return and run a business providing sustainable alternative energy solutions to Guam. He is the first in his family to pursue engineering. Images obtained from land-based telescopes suffer from image degradation due to air turbulence in the telescope optical path. This phenomenon is known as “seeing” in the field of astronomy. Astronomers are concerned with many different forms of seeing that affect telescopic imaging, including optical, atmospheric and dome seeing. A displaced-beam small aperture scintillometer (DBSAS) was tested as a possible tool to measure and quantify seeing in the observatory dome environment. The ability to measure the dome turbulence may lead to the capability of mitigating dome turbulence and enhance telescope imaging. The project involved commissioning and testing the DBSAS in various folded-path configurations to ensure that it has the sensitivity to operate within the volume of the Keck telescopes. The project also tested the scintillometer’s capability to measure the mean crosswind across the measurement path. The crosswind tests were performed in hopes that the DBSAS may also be used as a tool to understand the bulk airflow through the telescope structure. The project concludes that the scintillometer has the necessary sensitivity, ability to operate in folded configurations, and can measure crosswinds within the volume of the Keck telescopes. The data and process will be further analyzed and presented.